So guess who has to go back to work next week? That’s right, this guy. Technically, I went back yesterday for a bunch of conferences and meetings… but the kiddies start coming next week. So with the impending end of summer vacation breathing down my neck, this past week has been a frenzy of trying to cook as much as possible. Once the school year starts, getting quality kitchen time is a whole lot more difficult. I just got a bag of super fragrant peaches from my weekly CSA share, and remembering back a few weeks ago when Tyler made a batch of blueberry hand pies, I decided to give baking a go. I’m a guy that absolutely loves to reap and enjoy the baking of others. Baking myself, though? Not a huge fan. I don’t know why. I guess I’ve just always thought it’s difficult. And making pastry crust. Ugh. I’ve heard how much of a pain that is. 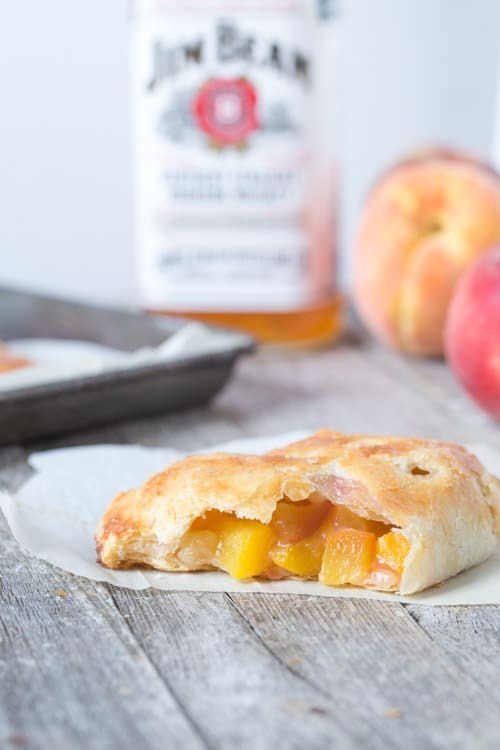 But actually, this Bon Appetit hand pie crust was super simple and easy, even for me. And it’s light, flaky, and buttery. Basically everything you could want from a crust. Don’t be afraid of the bourbon. You honestly really don’t even taste it. It just kind of enhances the flavors a bit. If you’re still scared, feel free to leave it out. I won’t tell anyone. Promise. I’m thinking I like hand pies even better than regular pie. You get a perfect ratio of fruit and crust in every bite. And you don’t even need a fork. Or a plate. Freeze the diced butter for about 10 minutes in order to get it well chilled. In a food processor, pulse together the flour, sugar, and salt. Add well-chilled butter, pulsing until it’s well incorporated and resembles the texture of very coarse cornmeal. Add 1/4 cup of the ice water and pulse, adding more water if dry, until dough comes together in clumps (My dough required a little more than 1/4 cup). Form dough into a square, wrap in plastic wrap, and chill until firm, at least 2 hours. Crust can be made and stored in the refrigerator up to 3 days ahead of time. Peel peaches if you want (I didn’t and honestly couldn’t even tell the difference). Remove pits and chop peaches into a small dice (about 1/2″ pieces). 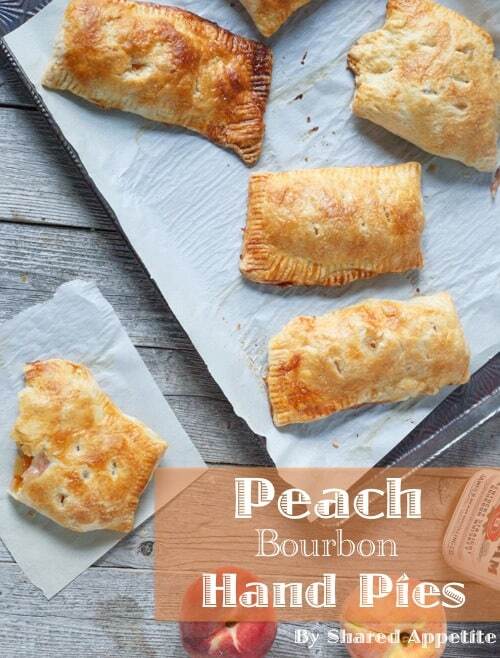 In a bowl, combine peaches with flour, sugar, bourbon, vanilla extract, and a pinch of Kosher salt. Roll out dough on a well-floured surface to about a 15″x12″ rectangle. Cut into 6 equal rectangles (a pizza cutter makes this easy). On one half of each rectangle, mound a bit of the peach mixture. Brush perimeter edges of each rectangle with water and fold dough over, pressing edges to seal. You can create a decorative seal by pressing the back of fork around the edges of each hand pie. 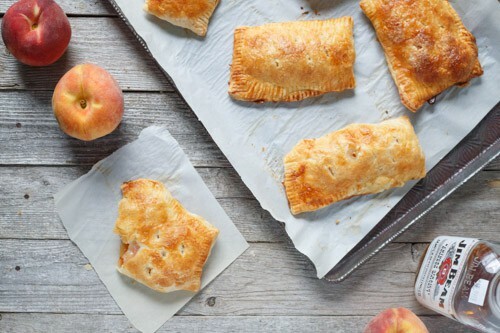 Place hand pies on a parchment-lined baking sheet. Whisk together the egg with a splash of water to create an egg wash. Brush the top of each hand pie with egg wash and sprinkle with sugar. 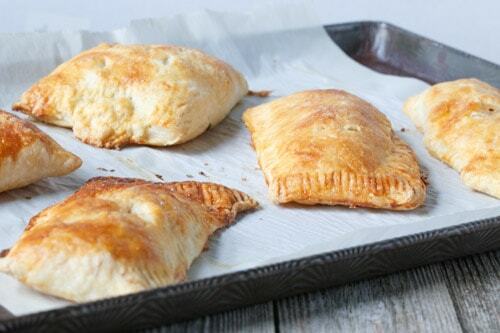 Cut a few slits in the top of each hand pie to allow steam to escape during baking. Leftovers? 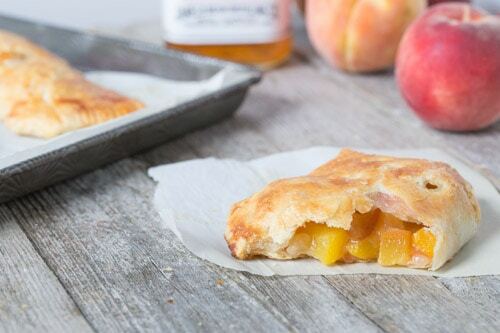 Let hand pies cool completely and refrigerate. Reheat in a 375°F oven until warmed through. I know, Fall is totally great, but I’ll skip the pumpkin spiced stuff (not a fan oddly enough). Love cider though. LOVE. Hmmm, cider-glazed things sounds quite wonderful! Thanks Heather… luckily the first week back was just two days. If only every work week was that short!